Last week, I completed reading my second book of this early year. In 2019, I have set a personal goal to read a certain a number of books. The one I just finished reading is titled The Bonsai Theory of Church Growth by Ken Hemphill. I have known about this book for just about my entire life and have been meaning to read it. So, I finally did. The book takes the theories and practices of caring for bonsai trees and applies them to church growth. Admittedly, I completely misjudged what the book was going to say. 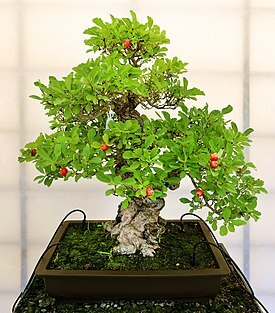 It basically took the practices of caring for bonsai trees to keep them small and showed how we do that in churches and consequently keep them small and not achieving the growth that God intends for all congregations everywhere. Hemphill makes a distinction between church as the people of Christ and the church building. This particular distinction has me thinking of how often we talk about “church” as the building and not the people of Christ. Therefore, I am now contemplating how I prevent my own personal growth in Christ by doing things that keep me from fully realizing what God has in store for me. First, I have a limited vision. My vision entails taking care of me, my family, and my business. Now that is not bad, but as a Christ-follower I have been called to and commanded to take care of His world and His people. This means caring for those less fortunate than me, but it also means sharing the Gospel of Jesus Christ with all those I come in contact with. When my vision is limited to myself, I can miss out on what God has in store for me. Secondly, I give up on people. For example, in my position as a youth leader I was planning on “trimming down” my student roster – removing those students that have not been to church or Youth Group since I arrived. However, Hemphill stresses “don’t prune them; go find them!” (41). I think many of us do this with lots of people in our lives. Instead of eliminating them, we should pursue relationships with them and reconnect with them. Thirdly, not welcoming new people and not actually discipling them. As a Christ follower we are to share the Gospel, but we are specifically called to make disciples (Matthew 28:18-20). The problem is: we don’t know any non-Christians or we feel that we are not the ones to disciple anyone else. We don’t know enough. We are not perfect. We are not old enough. This year I am challenging myself to be discipled and disciple others. One step might be to intentionally find new people in my community and get to know them. Finally, trying to look good but not practical. The Bible says very clearly that God looks at the heart of people not their exterior, but I still try to look good to everyone. Say the right things. Do the right things. Work for the approval of people and not God whether personally or in ministry. God has called every one of His followers to fulfill the Great Commission of making disciples, so the question I have for myself is: am I doing that or am I giving the illusion that I am doing that? Thank you for sharing thoughts from this book! Someone recommended it to me several years ago, but I have never read it. You have helped whet my appetite to read it.